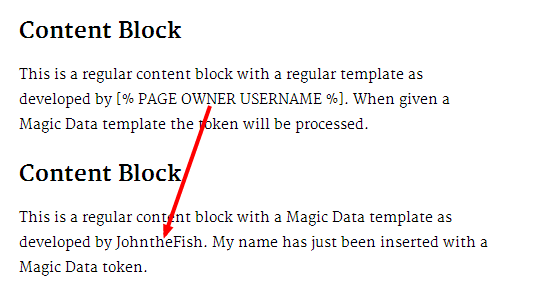 By installing this addon on top of Magic Data, you can use Magic Data simply by assigning a block template where you need it. Simply assign the appropriate block template and Magic Data tokens will be recognised and symbols evaluated. Magic Data Select - a select with options defined by magic data. You can use any attribute within a Magic Data expression. These new attributes actually process Magic Data expressions wrtitten inside the attributes. If you find the core cache obstructs some uses of Magic Data, Cache Free Content provides Magic Data and Blocks By AJAX templates together with cache free clones of the core Content and HTML blocks. 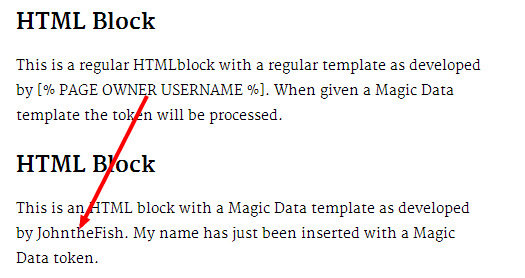 If you also have Blocks by AJAX, additional templates are provided for AJAX loading the Content block and HTML block while processing Magic Data. If you want some Magic Data enabled templates with a bit of built in flourish and for a few more blocks, have a look at Enlil Transparent Content. Version 2 of Magic Data Templates now provides Magic Data symbols to assign classes and styling to templates from Magic Data expressions within the block the template is applied to. For example, a Magic Data expression within a block can determine what background and shape the block will have! You can also now use Magic Data enabled attributes in any place you would use regular attributes. Magic Data Direct attribute - select a snippet to be evaluated when the attribute is displayed. Magic Data Select attribute - enter Magic Data expressions to create lists that can then be selected from in instances of the attribute. This is the ultimate select attribute (requires Uber List v1.11.1+). The list of symbols available from Magic Data is constantly growing and you can pull all sorts of page, user, eCommerce product and form data into your blocks.